Newly updated edition of the "Bible of practical EMTALA Compliance" for healthcare providers, hospitals and their attorneys. These updates highlight legal developments and regulatory changes since the 2008 edition, along with the accumulated enforcement information since the 1986 inception of the law. 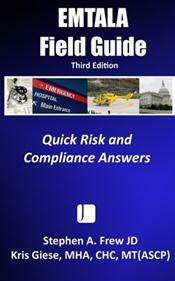 In addition to a narrative summary of the law and the most recent version of federal site review guidelines for EMTALA compliance, this book features quick "flash card" reviews of individual EMTALA compliance topics, the real world application, necessary compliance documentation, and cautions on common compliance issues.